This week I decided to take advantage of being up here during winter time and find some snow related activities to do. I also got to visit Vermont and New Hampshire for the first time. I started out my adventures this week in Vermont. I went snowboarding at the Mount Snow resort. Vermont is known for having lots of ski resorts, and I picked Mount Snow because it also happens to be located in the Green Mountains National Forest. The resort operates with special permission from the forest service, and the area was absolutely gorgeous. Even before getting to Mount Snow, the drive in through the forest area with all of the trees with a fresh coating of snow were beautiful. I had only ever been snowboarding once before in Colorado, and I will say that Vermont was not as beginner friendly of an experience as Colorado was. The mountain and trails were great and there were plenty of easy runs, but the customer service and guidance for true beginners was not the best. I still had a blast all day, and I was exhausted by the time I got home. I had planned on heading out pretty early for my second day of adventures, but I was so tired and sore from snowboarding that I got a little bit of a later start for my trip to New Hampshire. The big plan for New Hampshire was a dog sledding tour, and I was going to do some scenic driving and maybe make a few stops before going to the tour. Because I started a little later than I had planned, I didn’t do as much of the Kancamangas scenic drive as I had planned, but most of the places to stop along the drive were covered with snow so I couldn’t stop anyways. The scenic drive goes right through the White Mountains National Forest area, and even though I couldn’t stop to take pictures, it was a stunning drive. I can only imagine what it would look like in the fall, because it was amazing even without brightly colored leaves. The mountain area just went on and on in every direction as well, and it was amazing to see all of the trees and the snow-covered peaks. The dog sledding tour was only a few miles off of the scenic drive, so some of the pictures for it have the mountains in the background, but the pictures don’t even do justice to how magnificent the area was. After driving around for a little bit, I went to my dog sled tour. Meeting the dogs and seeing how much energy and excitement they had to be running and pulling the sleds was amazing. The ride itself was only about 20 minutes, but the course we took was beautiful and had great views of the river and mountains. The time of day was also perfect because the sun was just getting ready to set. The dogs were a lot of fun, and the people running the tours were so kind as well. They had Alaskan Huskies and Siberian Huskies on different teams and talked about some of the differences in color and size between the two. I had an amazing time during the ride, and I loved getting to meet the dogs and their people. 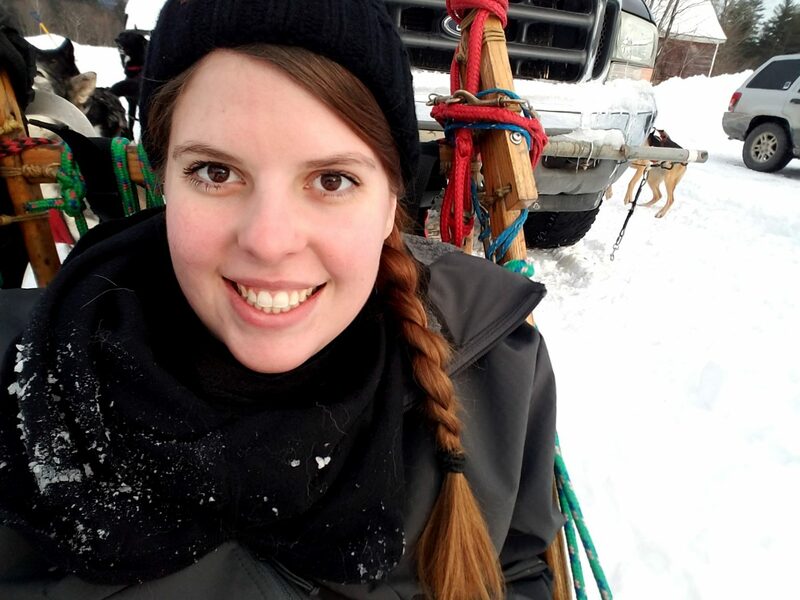 I learned a lot about dog sledding and racing through the experience as well, and I definitely would love to go again someday. Everyone has said that winter was a bad time to come up here, but this week’s adventures couldn’t have happened any other time of year. I really enjoyed getting to take advantage of not just where I am, but the season as well. Hopefully I will get to take advantage of timing in more of my adventures while I’m here, but I’m still figuring out what those will be.